The SEE-ME is a revolutionary new characteristic evaluation tool providing insight into the make-up of your personality build. A simple selection of evaluation questions can provide real characteristic insight into your personality and positively move you towards improved relations with others. Take your Free Evaluation NOW! Would you like to interact with your work colleagues more effectively ? The SEE-ME Evaluation system is unique and specific to you. The SEE-ME Evaluation System has been developed over several years and is now available only from Compass Meridian and its associates. Your Free SEE-ME Evaluation Description will provide real insight into your characteristic base of your personality build. If you require more in depth information then you can select to receive a detailed premium editorial providing all you need to change the way you relate with others starting today! If you require more information then please call us on +44(0)330 0010497 discuss your specific requirement and get started today! Access your reports and take further evaluations at any time worldwide with no restrictions. Access the SEE-ME Evaluation system from any device via your web browser. Your personal data is available only to you, and you can change your account details at any time. Are you are currently providing personality profiling, or a complementary service? Speaking plainly, personality or character assessment is not an exclusive preserve of psychologists. People naturally assess each other when they meet for the first time, how does this affect success in life, or success at work? What about relationships? Take a personalised evaluation with the Compass Meridian. Find what your advantages are and how to use them. See what your quadrangle characteristics reveal about You. Know when you are at Your Best! On Good Days take advantage of your abilities! On Bad Days be cautious and alert to risks or dangers. Think twice! Know how to Develop Saint from Sinner. Understand how to be positive and to maintain drive. Improve your Compatibility & Success. 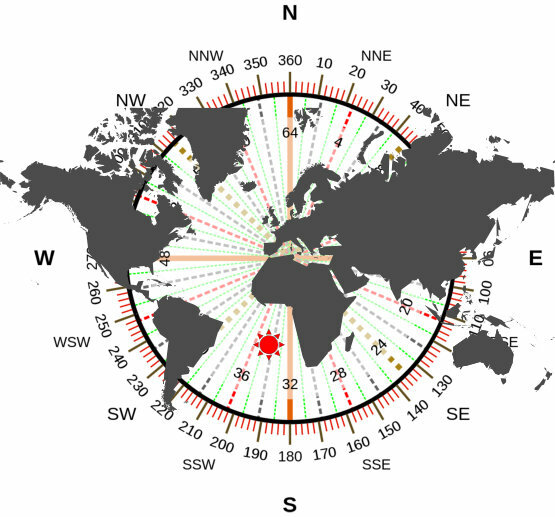 Use your characteristic way to full advantage in each quadrant tropic zone: from 0° to 360° north, east, west or south and back to 0°.